Little Meg cairn. The carved stone is the low flat rock to the left of the largest upright. 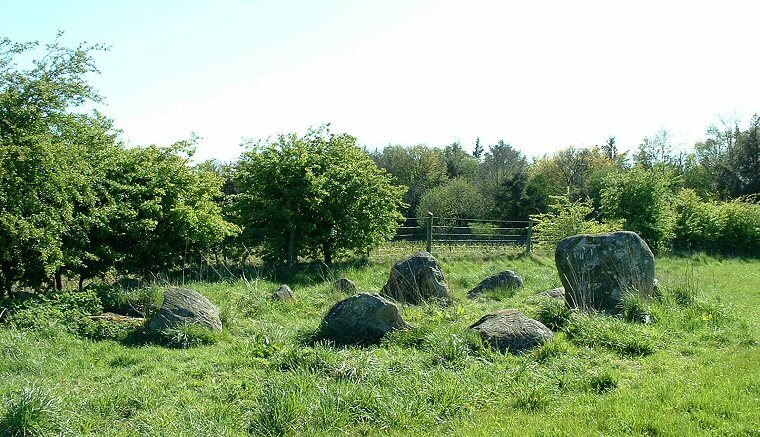 Although Little Meg is sometimes referred to as a small stone circle, it is in fact the remains of a burial mound or round cairn. This would have originally consisted of a central burial cist covered by a low barrow of stones and rubble, the whole structure surrounded by kerb stones. The cist, now destroyed, was found to have contained a cremation in an urn. The mound has also now gone, but the ring of kerb stones remain measuring between 8-9 metres in diameter, although it is probable that their positions have been disturbed in the past. These 10 or 11 remaining stones stand at the edge of a quiet field about half a mile northeast from the huge standing stone and circle of Long Meg and her Daughters but are thought to be of a later Bronze Age date. 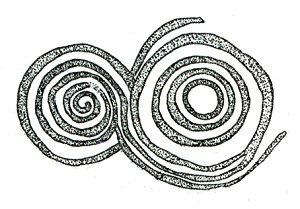 Two intricately carved rocks were discovered here, one was removed and can now be seen in Penrith museum, the other is still in place and shows a clockwise spiral motif on the left hand side that links in with a series of concentric circles to the right. The whole design measures around 80 cm across. To get to Little Meg, follow the road northeast from the village of Little Salkeld to Glassonby. About half way along stop just before a small wood on the left. The stones are a short distance down the gated track that runs between two fields. 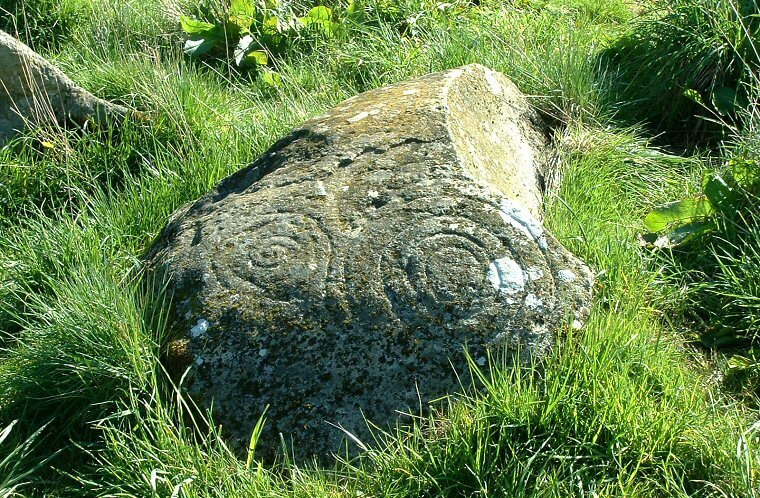 Little Meg carved rock, a clockwise spiral linked to a set of concentric circles.